Mulch volcanoes occur when mulch is regularly applied too close to the tree trunk at a rate faster than the mulch can decompose. During the first three months of 2013 Danny and I had been asked to excavate a number of young live oaks (Quercus virginiana) with mulch volcanoes and to fix the problems we found. We knew from previous excavation on individual trees that we would likely often find some nursery ropes, straps and wire baskets left behind that are beginning to girdle the growing trunk. We also expected to find an occasional stem girdling root. But we weren’t prepared for the extent and consistency of the problem. 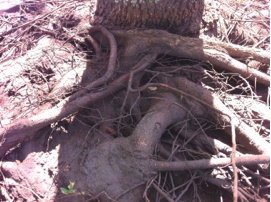 The stem girdling roots grow upward to the top of the mulch volcano and then wrapped around the trunk. The problems weren’t found in just a few isolated instances but rather every tree that had a mulch volcano had some degree of stem girdling roots. 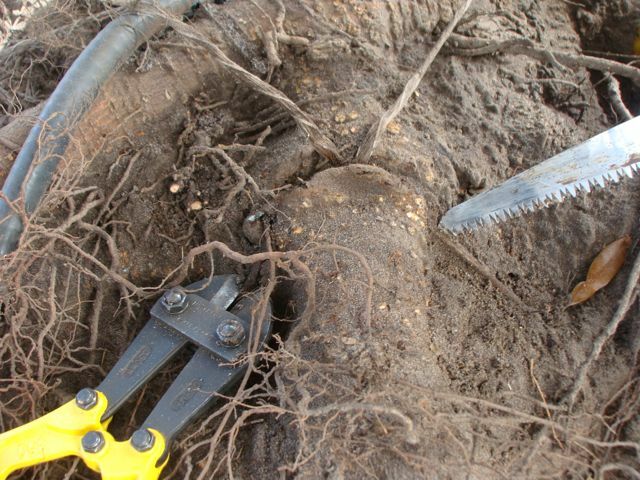 To do the root crown excavation, we used an Air Spade excavation tool which uses a 200 CFM air compressor and directs a stream of high velocity air at the mulch and soil safely removing the soil and mulch from around the roots without damaging the roots. 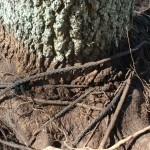 The wire basket is visible crossing between the two large lateral roots. The wire has caused some girdling (visible by a narrow indentation on both roots blightly below the middle of the image) and stress but is gradually becoming enveloped by the growing roots.The tree will likely survive but this is not a good thing. More rope and wire basket girdling on this root. Nursery ropes used to secure the rootball during delivery should be removed. If not, the ropes will girdle the trunk as the tree grows. 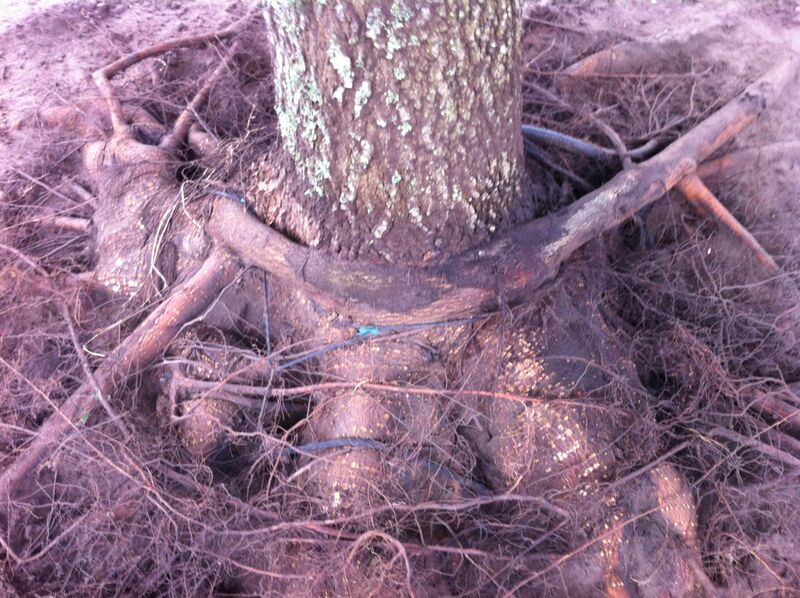 Sometimes an adventitious root will follow the rope path increasing the damage by becoming stem girdling roots. Nursery ropes used to secure the rootball during delivery should be removed. If not, the ropes will girdle the trunk as the tree grows. Sometimes an adventitious root will follow the rope path increasing the damage. 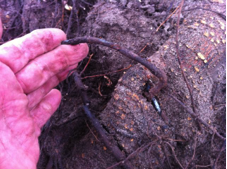 Once the soil and mulch have been cleared away, the remaining exposed wires from the wire basket were cut and removed and nylon ropes used by the nursery for transport and to lower the tree and root ball into the planting hole were also cut and removed. In most cases the wire baskets and the ropes have either become completely enveloped by the roots or were beginning to cause girdling and strangulation of the expanding roots and trunk. We also found that the excessive layer of mulch placed around each tree has encouraged root growth upward from the soil into the mulch. 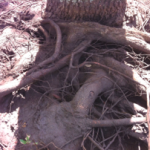 These vertically growing roots eventually began growing horizontally once they reached the top of the mulch pile and then started growing downward across the trunk or root flare. 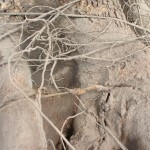 The result of this unnatural root growth pattern is many of these newly formed roots above the natural soil grade had become stem girdling roots that were strangling the root flares and trunk. 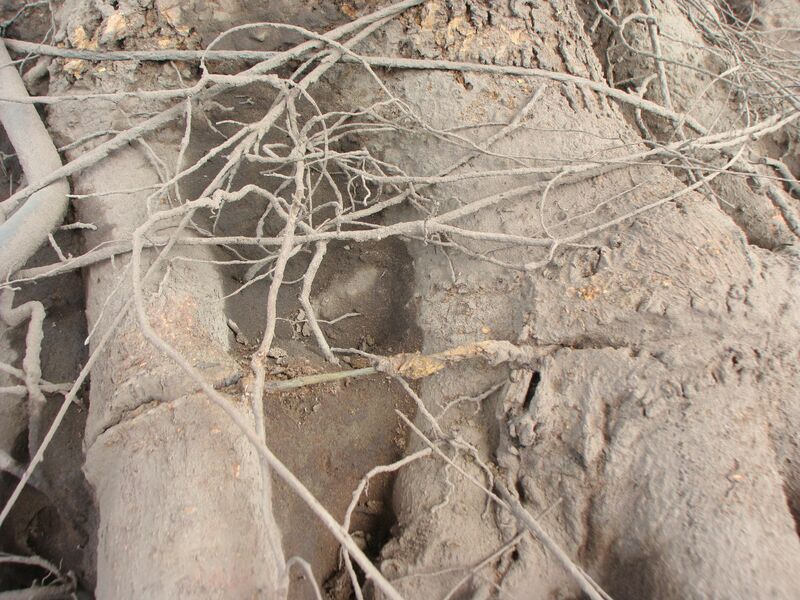 Every one of the trees excavated was found to have some level of damage from wire baskets, girdling from nylon ropes and root flare or trunk strangulation caused by stem girdling roots. 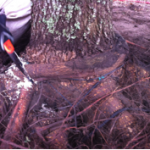 Stem girdling roots should be cut or, unlike nylon ropes and wire baskets, stem girdling roots will continue to grow and increasingly strangle the tree trunk. 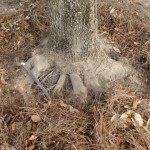 These stem girdling roots encircle nearly the entire trunk circumference. Photographs are included below to illustrate our findings. In our opinion and that of the client the root crown excavation treatment was highly successful and valuable in helping maintain and promote continued growth of the trees. Some of the crowns of trees were beginning to show areas of sparse foliage and delayed spring leaf flush. 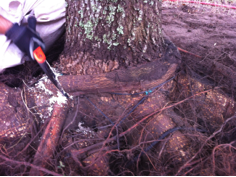 Without these corrective root treatments the condition of the trees would have continued to slowly worsen each year as more roots were impacted by the numerous conditions we found. 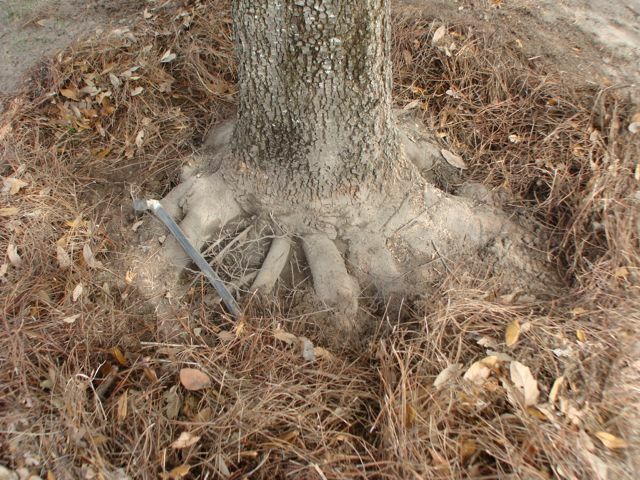 Without the Root Crown Excavation treatment, the lifespan of these improperly planted trees would be measured in decades not centuries as should be the case for live oaks. Sometimes a piece of the cut root can be removed. 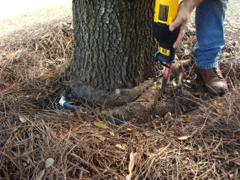 Other times just cutting the root and leaving it in place is enough to allow the tree to push the root off as the trunk expands over the next year or two. 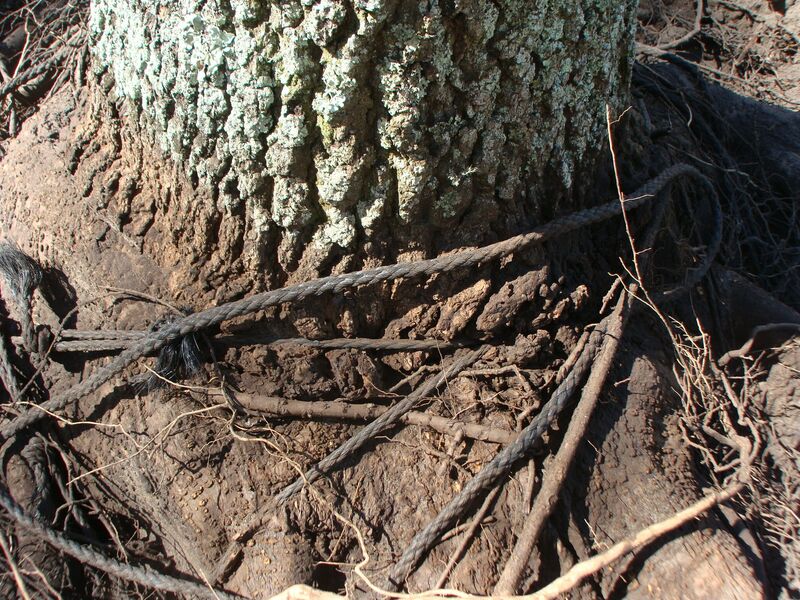 Often we found evidence that the ropes and wire baskets were being slowly enveloped and grown over by the trunk and root flares. 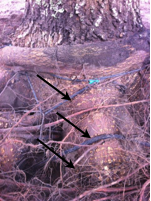 Eventually these points of rope and wire basket-induced strangulation of the vascular system in the trunk and root flare seem to self-correct over time. 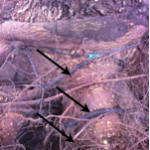 However, there appears to be a stress area when this happens where vascular tissue in the trunk is temporarily blocked for a few months or more as the tree envelops the rope and wire basket. The problem is ropes are at various positions are the trunk kind of in a tangled mess. So as soon as the tree envelopes one section of rope, it encounters another and then another. The stress period is extended for many growing seasons. But the real long-term problems are the stem girdling roots. These cannot often be overcome by simple trunk expansion. The root grows too as the trunk grows and the girdling becomes worse. Here the root flare is not even visible. 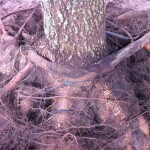 It is covered by two layers of stem girdling roots. 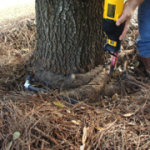 We do not believe that another root crown excavation treatment will be needed on these treated trees as long as future mulch applications can be kept 18 to 24 inches back from the trunk of each tree and kept to a depth of no more than 3 inches. 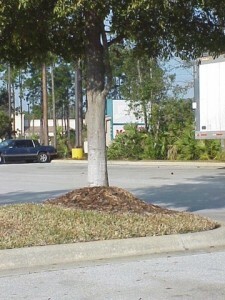 We have found over the years that a 3-inch layer of mulch will decompose over a period of approximately 3 years (here in north Florida). Consequently annual mulch applications are not needed and will only result in more mulch being applied at a rate greater than the decomposition rate resulting in an accumulation of mulch and the stimulation of more stem girdling roots. 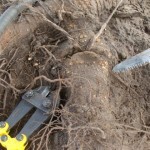 A root crown excavation treatment in which a number of large roots are cut and removed does result in some level of stress for the trees. The trees are fairly young and quite tolerant of this type of stress. However, making sure the trees are adequately irrigated at least once a week through the spring and summer will help reduce any negative effects of this stress. Some root sprouts can also occur following root crown excavation treatment especially if a significant number of roots are cut. Here is a piece of wire somewhat corroded nine years after installation. The root has enveloped most of the wire with this piece protruding. 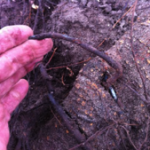 Here both a wire basket and the nylon twine are girdling this root. The nylon twine is coming out of the top. Once the mulch volcano and fill soil has been cleared away from the base of the tree, mulch should not be reapplied any closer than 18 to 24 inches from the tree. An new organic mulch should only be applied when the old mulch has nearly decomposed. Copyright © 2019 Advanced Tree Care, Inc.